FALCON HEAVY MAKES A "ROCKET COMET": On April 11th at 6:35 pm EDT, SpaceX launched the new Arabsat-6A communications satellite onboard a Falcon Heavy rocket. Later the same evening, Petr Horálek looked up at the Milky Way from Soneva Fushi, an atoll in the Maldive Islands south of Africa. "I got a big surprise," says Horálek. "From out of nowhere, a big diffuse slowly moving object appeared in Aquarius, getting wider and wider, and looking like a big comet in the sky." Horálek witnessed the Falcon Heavy's second stage, executing a burn which propelled the satellite into a geosynchronous orbit. 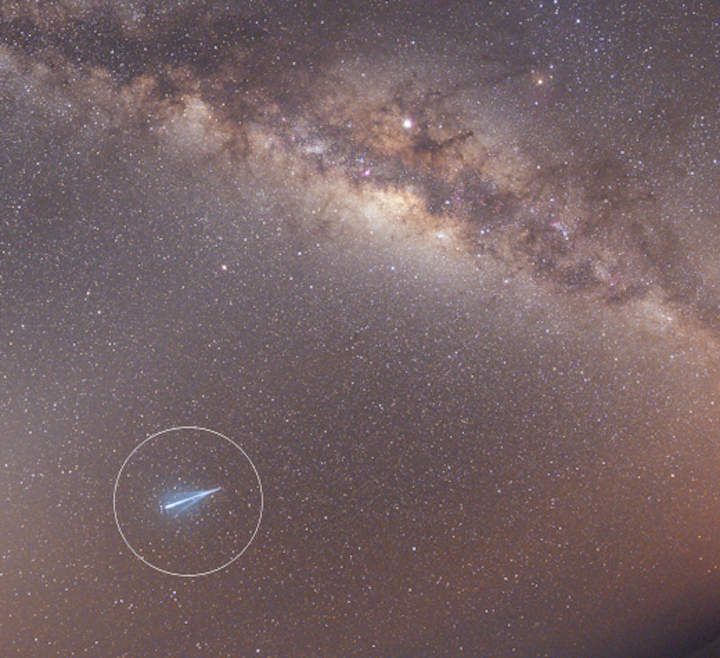 "The image shows an 8 minute long exposure of the phenomenon while the object was expanding in the sky (moved from right to left)," he explains. "I have never seen something like that before, such a unique and spectacular show in the sky!" This is the same type of rocket that, on its maiden voyage 14 months ago, hurled a cherry red roadster to the orbit of Mars. The Falcon Heavy is currently the world's most powerful rocket and has the third-highest capacity of any rocket ever to reach orbit, trailing only the America's mighty Saturn V and the Soviet Energia. If SpaceX continues its successes with the Falcon Heavy, "rocket comets" could become a frequent sight in the years ahead.